We now occupy 61,500 sq. ft., which includes the construction of a 13,500 sq. ft. addition that houses the grind department. Twenty-eight precision grinding machines including the Okuma CNC cylindrical grinding machines, multi-function internal Okuma CNC grinding machines, CNC jig grinders, Excello thread grinders, precision center grinders, hones and CNC surface grinders have moved into the new facility. This area is temperature controlled allowing for the tightest of tolerances to be held. One of our newest additions to the grind department and our unique grind cell is the Okuma GP-47-FII (pictured right) – OD Grinder. With its powerful spindle, head stock and tail stock design, the machine is built to accommodate longer and heavier work pieces (up to 660 lbs.). Our CNC OD grinding cell (pictured above) is comprised of three grinding machines, one with a magnetic chuck, one with a three jaw chuck, and one set up for between center work pieces. This cell saves time by eliminating footsteps and all three machines can be operated by two people allowing for more competitive pricing. 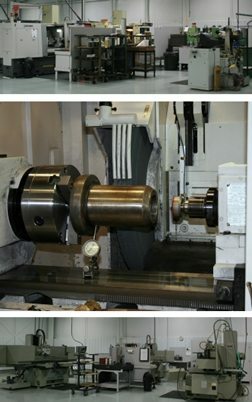 Also pictured is the surface grinding cell, which consists of three Okamoto automatic surface grinders. This cell is operated by one person making it much more efficient. Our staff of grinding professionals is eager to assist you with all your precision grinding needs.